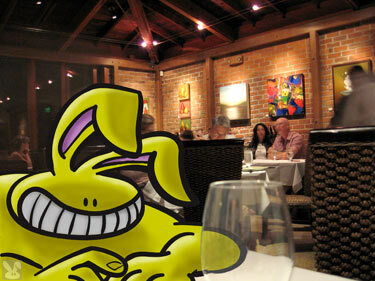 What kind of base campy eater doesn’t want to peek at Hill’s new restaurant? Not me. 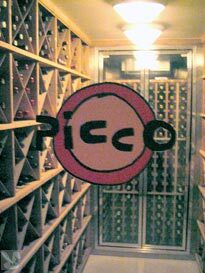 When I saw Picco was open, I had to summit up. Friendly and efficient. The staff is professional and informed. They have a lot of people poking their nose in and asking questions about this new eatery while they juggle a bustling dining room, lounge and bar. Fun and lively. The bar attracts the non-geriatric Marin set. The music ranges from rock to reggae at a level that is comfortable for discussion. 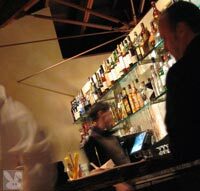 There is a cool lounge area in back and a private dining room for a small gathering/party. Contemporary artwork lines the walls above the cozy booths in the main dining room. Clientele are dressed in business casual, flirty dresses and jeans. Fresh, delicate slices of local halibut topped with crisp, mini radish matchsticks, perfect baby leaves of opal basil and tiny snips of chives (whoever sorts the micro greens and slices the veggies with such surgical precision is probably moonlighting from one of the plastic surgeons' offices across the street.) The soy and Southern Italian olive oil pulled all the tastes together swimmingly. 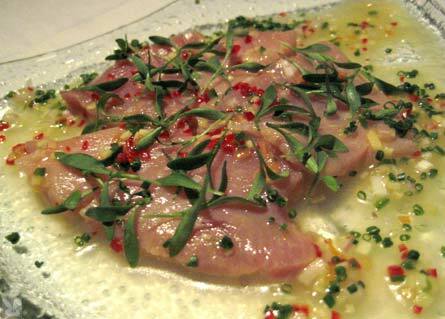 This local tuna rested in a pool of tangy citrus sauce flecked with chilies. Cilantro sprouts crowed this fusion of flavors. Don't think caliente when you see the red confetti, the chilles are flavorful, but don't peg on the Scoville meter. 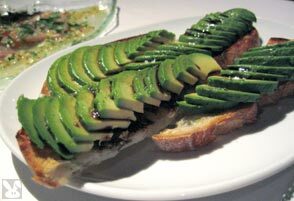 Perfectly ripe, sliced avocados were fanned out over Panorama toast and drizzled with balsamico. I wanted them a little saltier so I asked for some of their Maldon salt (the best salt ever.) They were nice enough to bring me out a little ramekin of these little sodium pyramids to perfectly balance out this fruity toast. No, these are not pac men that are eating their powerballs, they are sliders done right. I loved these little babies. Not only did they have the correct ratio of meat to bread, but the roll stood up to the meat without dominating it in the texture department. The rocket was tender with a slight pepperiness. 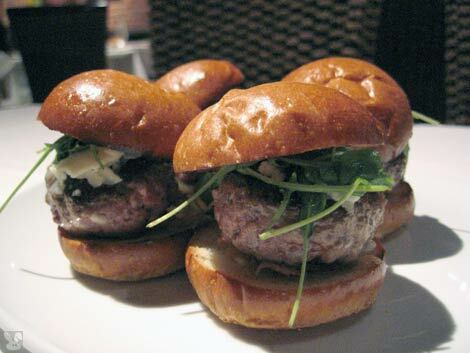 The truffle cheese, onions and aioli balanced the flavors out to a mini burger perfection. Their meaty goodness turn me into a Pac ghost, I goobled them down. Check out their wine room. If you're not up for a bottle, they offer wines by the glass. Pepato (sheep's milk with peppercorns), St. George (cheddar style cow), Bucheret (aged goat), Mt. Tam (triple cream cow), Blue (it's really white - crumbly cow cheese) All these cheeses are from local producers and are served at the perfect temperature and degree of ripeness alongside slivers of medjool date, quince paste and walnuts. 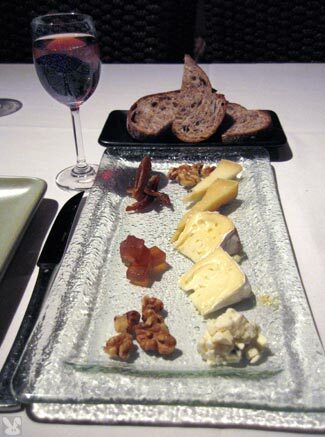 A plate of toasted Panorama walnut bread acts as a delicious cheese transport system. This restaurant is all about small plates for sharing. I’m all for the idea of sharing as long as that means that I can get a LOT of those yummy small plates. 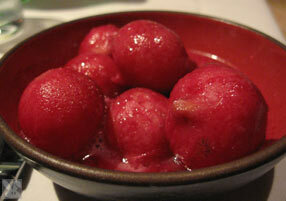 They focus on fresh, locally produced, organic ingredients. The meat is Niman ranch, the oysters are Hog Island, you get the idea. 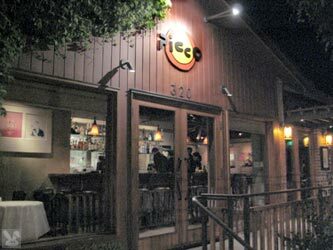 Head down to Pico. 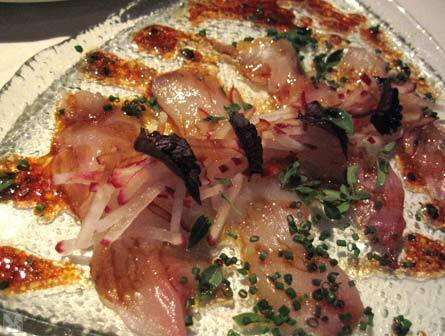 If you're a Larkspurian or Corte Maderite, it's a great addition to the neighborhood. It's "Boulder" than Java or Roxanne's (the former residents of this building.) If you must travel to get here, it's worth a trek. Picco Rocks! Because they have just opened, they are only tackling dinners. Their menu will expand as they settle into their rhythm. I am anxiously anticipating their risotto (which will make it's appearance on the menu in a couple of months.) While I'm waiting, I'll have a few more mini burgers. Or maybe go to their excellent pizzeria next door. Don't be deceived by the picture of the tomato on one door and the picture of the zucchini on the other (I think that those are vestiges of the raw food restaurant that used to occupy this space) they are two large, unisex rooms which are clean and well stocked.